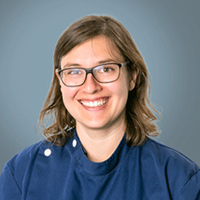 Daniela graduated in veterinary medicine in Switzerland from the University of Bern in 2007. She then completed an internship at Birkenfeld Veterinary Hospital in Germany and subsequently became an assistant doctor. In 2012 Daniela completed a neurology internship at the Neurology Section of the Clinic of Small Animal Surgery, University of Zürich, Switzerland; where she also went on to complete her three-year residency, and then worked up until moving here to the UK to work here at SCVS. Daniela has a special interest in inflammatory neurological disorders and neurosurgery.